While Governor John Kasich has been involved in Ohio state politics since 1983, he was born and raised in Pennsylvania. 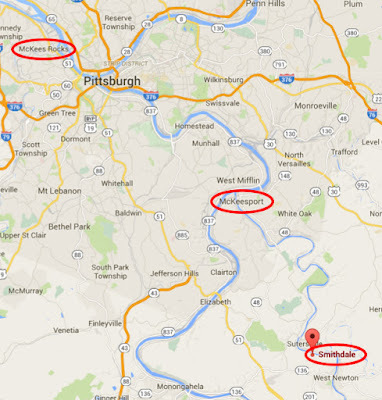 We know that Czech immigrants in Pennsylvania were few and far between. Is Gov. Kasich really, as he has said, of Czech ancestry? 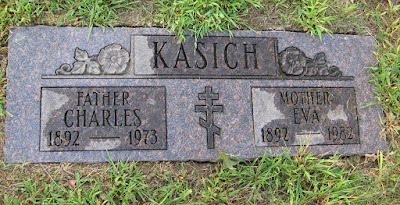 "She is the mother of Ohio Governor John Kasich." As the governor has stated, he has Croatian heritage, and his mother's maiden name Vukovich seems to be Croatian enough. But what of the Kasich side? 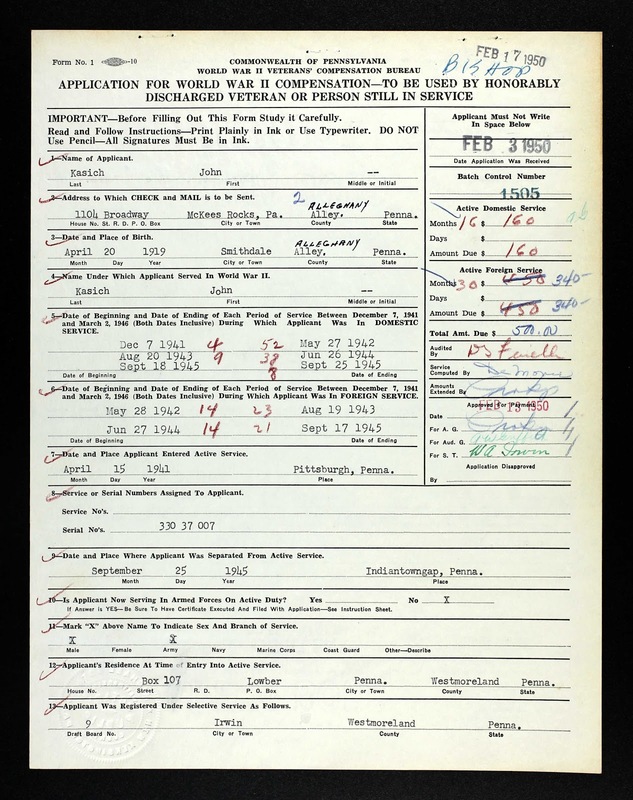 The following document gives the birth date and place of John Kasich (the governor's father): born April 20, 1919, in Smithdale, Allegheny County, Pa., and living in Lowber, Westmoreland County, Pa., at the time of his entry into military service in 1941. 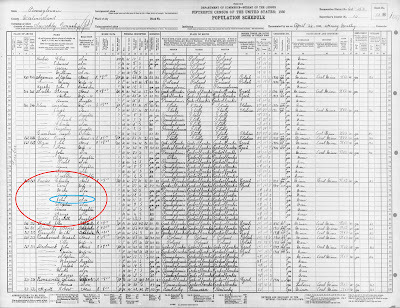 The 1930 Census shows the Kasich family (here spelled Kasics) living in Lowber, Westmoreland County, Pa., with parents Charley, a miner, and Eva, and children Mike, Andy, John (11 years old), Stephen, Ann, George, and Elizabeth. 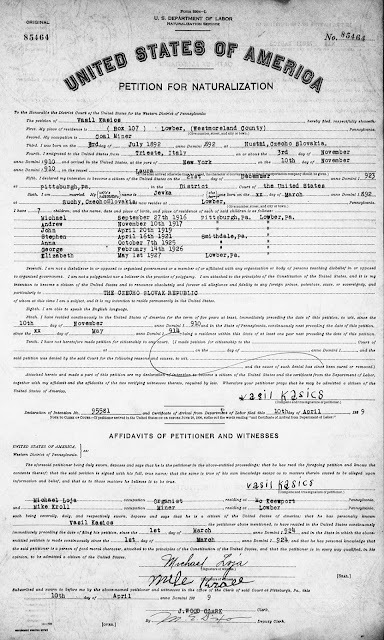 On this census form the country of origin of the parents is given as "CzechoSlovakia," and their mother tongue/native language is given as "Czech." Genealogists know how notoriously inaccurate the U.S. census has been when identifying these traits. 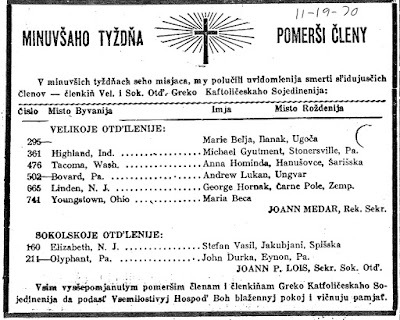 Looking at the several other "Czech"-speaking individuals on this form, we don't see Czech-sounding names among them. "Vasil" is a given name typical of Eastern Slavs such as Carpatho-Rusyns, Ukrainians ("Vasyl'"), and Russians ("Vasiliy"). Its occurrence among Czechs and Slovaks is almost nil. In the U.S., many men christened Vasil went instead by Charles or Bill (or occasionally Basil, its direct English equivalent). Vasil Kasics went at times by Charles or Charley. 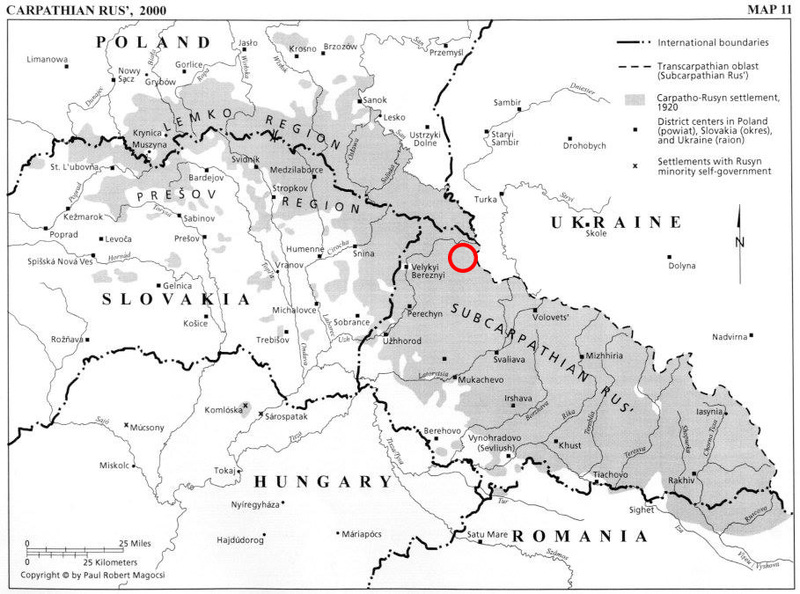 "Jevka" or Yevka, in English Eva or Eve, is likewise a typical Carpatho-Rusyn form of the name Eva. 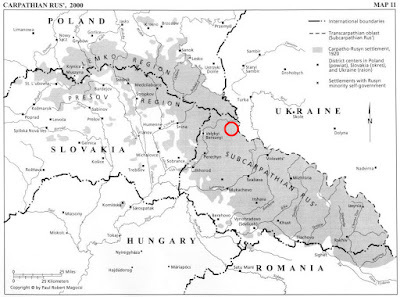 Vasil's birthplace is given as "Hustni, Czecho Slovakia"; Jevka's is given as "Suchy, CzechoSlovakia." See further information below. One of the witnesses for Vasil Kasics’s naturalization was Michael Loja, “Organist” from McKeesport. Actually, Loja was the cantor at St. Nicholas Greek Catholic Church, a Carpatho-Rusyn congregation (now known as St. Nicholas Byzantine Catholic Church). Loja was also the father of two American-born Carpatho-Rusyn Greek Catholic priests – Fr. John Loya and Fr. Stephen Loya. St. Nicholas Greek Catholic Church, while about 14 miles from Lowber, was the closest Greek Catholic church. And its sacramental records have many entries for Greek Catholics living in Lowber, Smithdale, Sutersville, and West Newton. 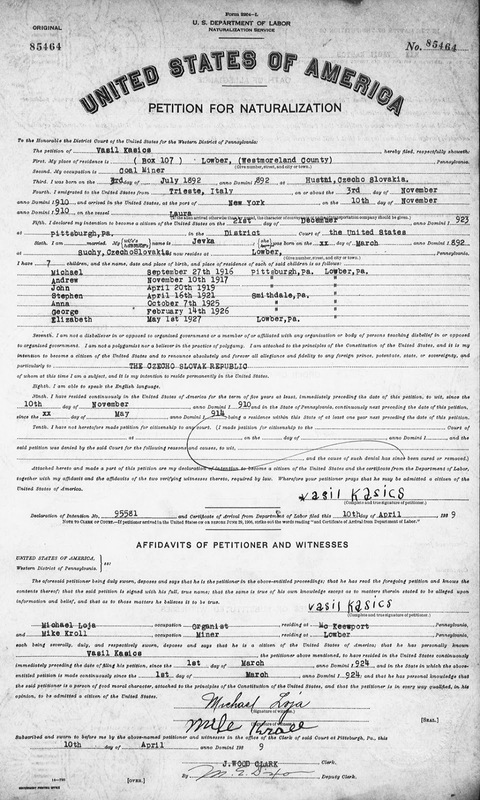 Indeed, the baptismal register of St. Nicholas Greek Catholic Church contains the record of baptism of John Kasich ("Ioann Kasič"), born on April 20, 1919 in Smithdale, son of Basil (i.e., Vasil) and Eva (Lukan) Kasič. The baptismal record also notes that Basil was born in "Huszno" (i.e., Husnŷj), Ung County, and Eva was born in the village of "Szuchi" (i.e., Suchŷj), Ung County. 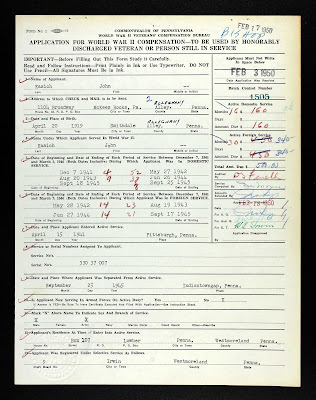 See the image of the record (assembled from two side-by-side photographs) below. The baptism was performed by the Reverend Valentine Gorzo, longtime pastor of St. Nicholas Church. 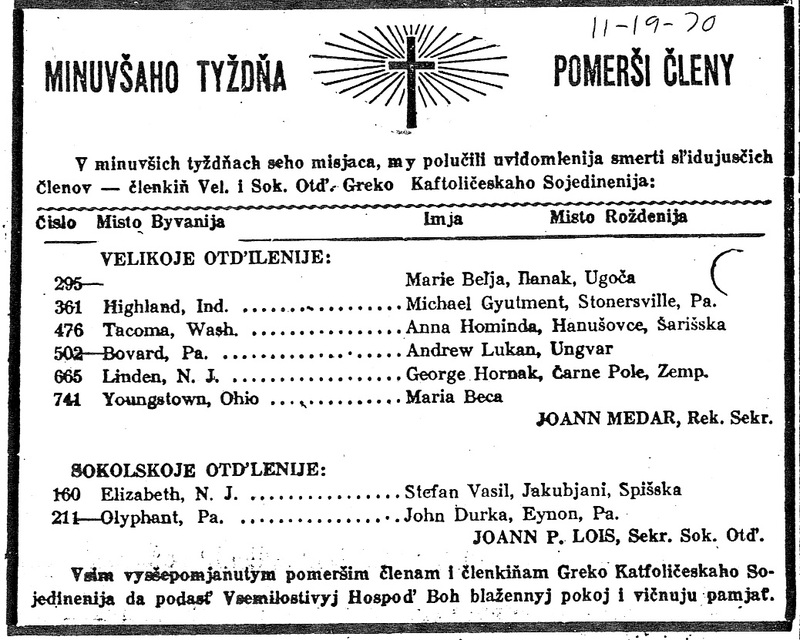 In the annotations column, it notes John's 1948 marriage to Anne B. Vukovich in St. Nicholas (Croatian) Roman Catholic Church on the North Side of Pittsburgh. 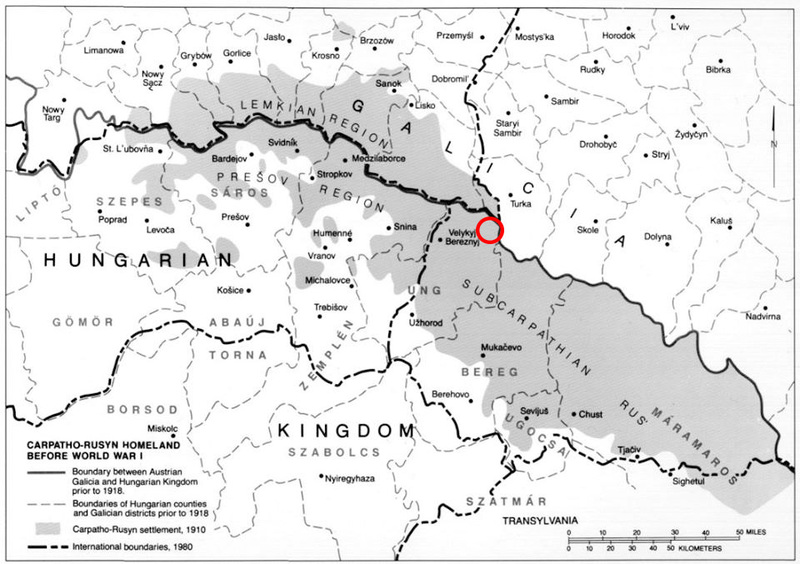 In 1929, when the Petition for Naturalization was filed, the territory of Ung (or Už) County was located in the Czechoslovak Republic. Today most of Ung/Už County is located in the Zakarpats'ka Oblast of Ukraine. 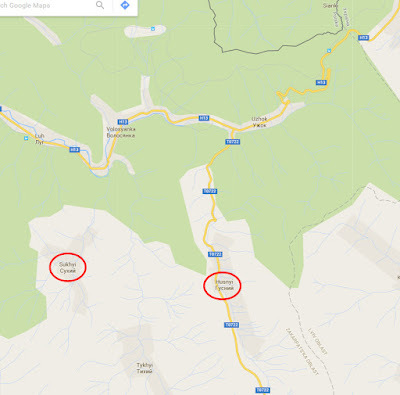 The villages of Husnŷj and Suchŷj are nearly adjacent, and located in the Zakarpats'ka Oblast. 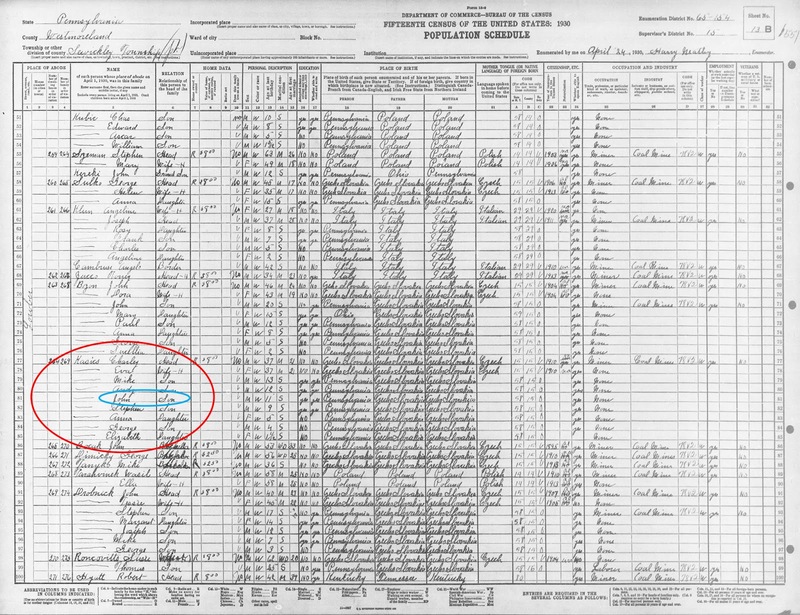 Basil and Eva's birthplaces as noted in the baptismal record for their son are consistent with those given on the Petition for Naturalization. 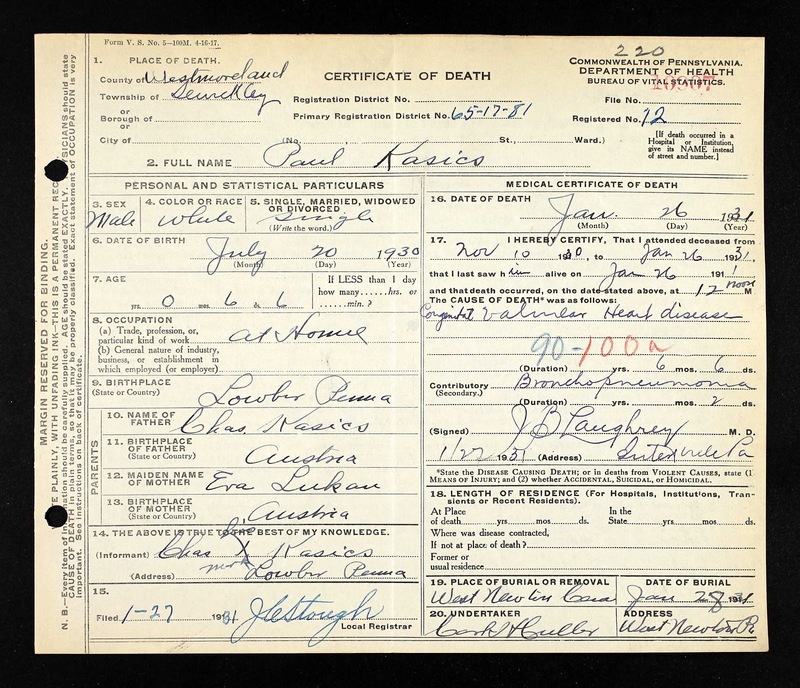 Vasil is named here as "Karol" (a Slavic form of Charles); presumably he was already using the name Charles in English, even though his naturalization document above refers to him as Vasil, his given name and the name under which he presumably entered the United States. Their birthplaces are given as Erdőludas, Ung County (which is now Husnŷj) and Szuhapatak, Ung County (which is now Suchŷj). 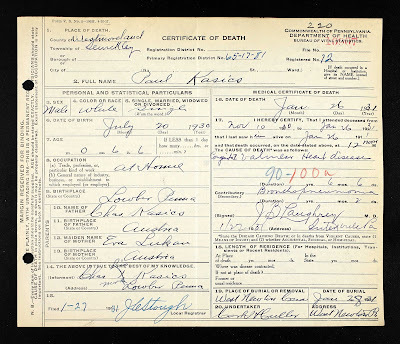 This a death certificate for Paul Kasics, son of Charles Kasics and Eva Lukan, born 1930 and died 1931 in Lowber, buried in West Newton Cemetery in West Newton, Pa., the main cemetery serving that area, including Smithdale and Lowber. 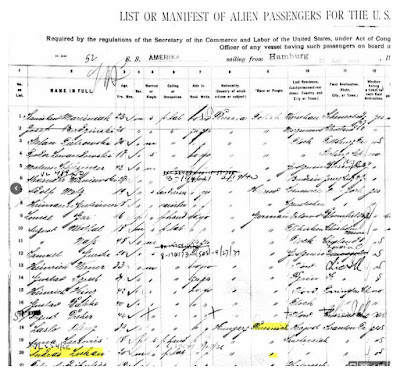 Jevka had a brother Andrew who came to the U.S. in 1907. 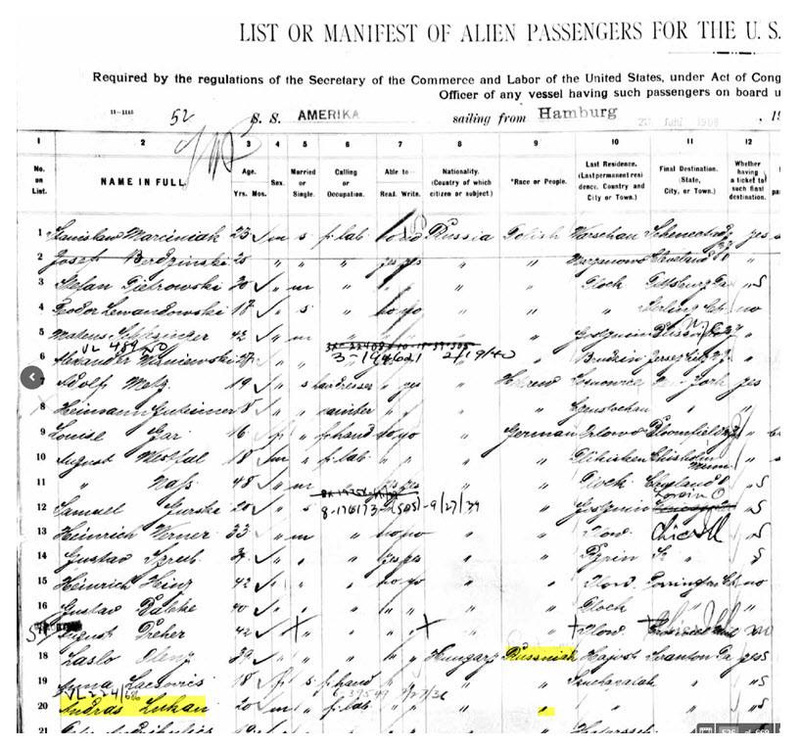 On the ship manifest, his birthplace is given as Szuhapatak, Hungary (i.e., Suchŷj); his "Race or People" is given as Russniak (a term used at the time as the equivalent of Ruthenian, to refer to Carpatho-Rusyns and Ukrainians). 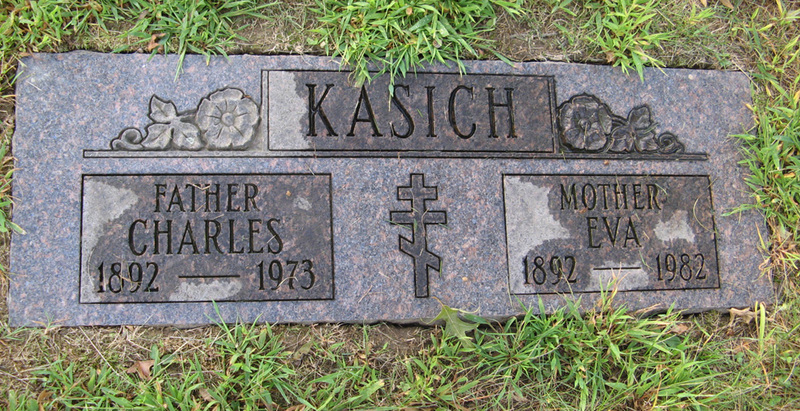 Andrew's 1970 obituary mentions his surviving sister, Mrs. Charles Kasich of West Newton. He was a member of the Greek Catholic Union of the U.S.A., the largest fraternal insurance society founded by Carpatho-Rusyns in the United States. 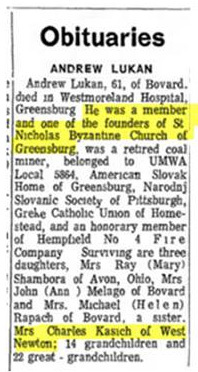 And the Greek Catholic Union's publication of deceased members in its Amerikansky Russky Viestnik/GCU Messenger newspaper from November 19, 1970 listing Andrew Lukan is below. 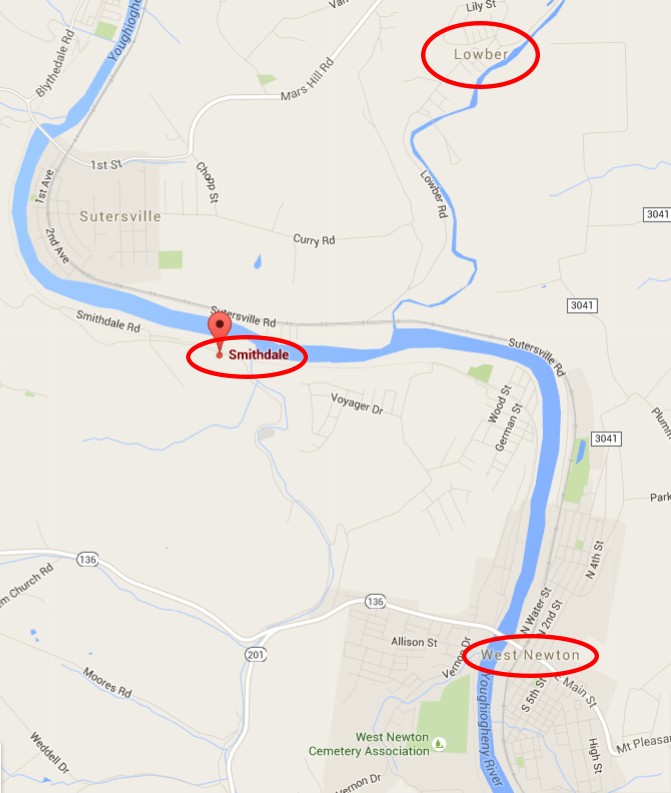 He was a member of Lodge 502 of New Alexandria, Westmoreland County, Pa. His birthplace is given as "Ungvar" (the old Hungarian name for Užhorod), which was the administrative seat of Ung/Už County. This was probably a simplification found either on his membership application or made by whoever was compiling the deceased member listings. The governor's paternal grandparents, Vasil ("Charles") and Jevka ("Eva") are buried in West Newton Cemetery. Their gravestone includes the traditional three-bar cross used by Slav Byzantine/Greek Catholic and Orthodox Christians, especially Carpatho-Rusyns. For the purposes of this blog, we are neutral on any presidential candidate's aspirations or qualifications. But we hope that this post sets the record straight about Governor Kasich's ethnic background and ancestry. So how would the name "Kasics/Kasich" be pronounced? The spelling in the Cyrillic alphabet is Касич. 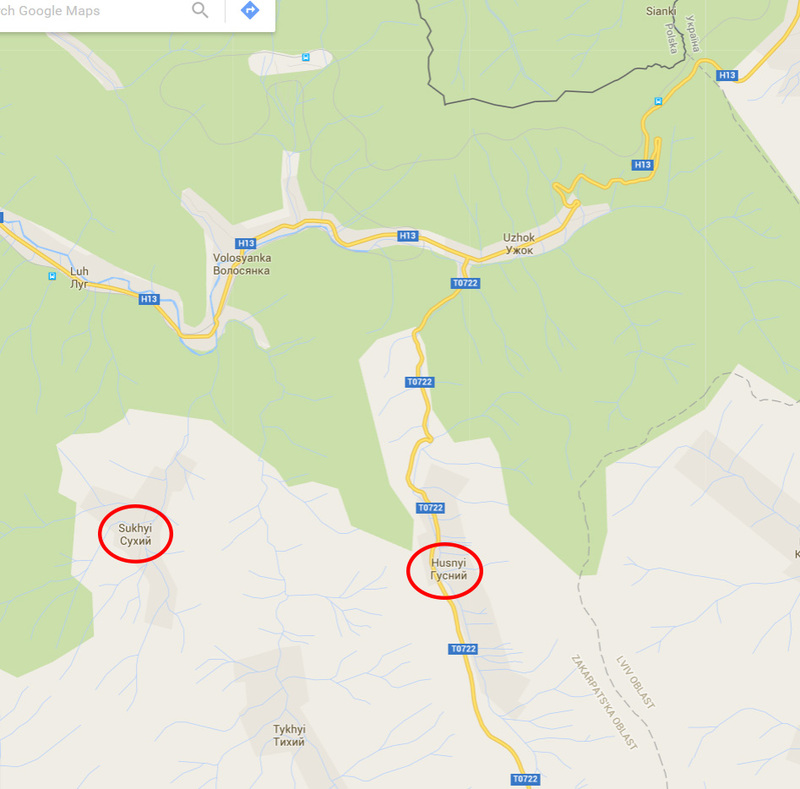 So in Rusyn that would sound approximately midway between "KUSS-itch" and "KOSS-itch." "Ohio Gov. John Kasich kicked off a six-day tour of Michigan Wednesday and held a rally in Warren. "We kind of think we're Czech," Kasich said to the crowd. 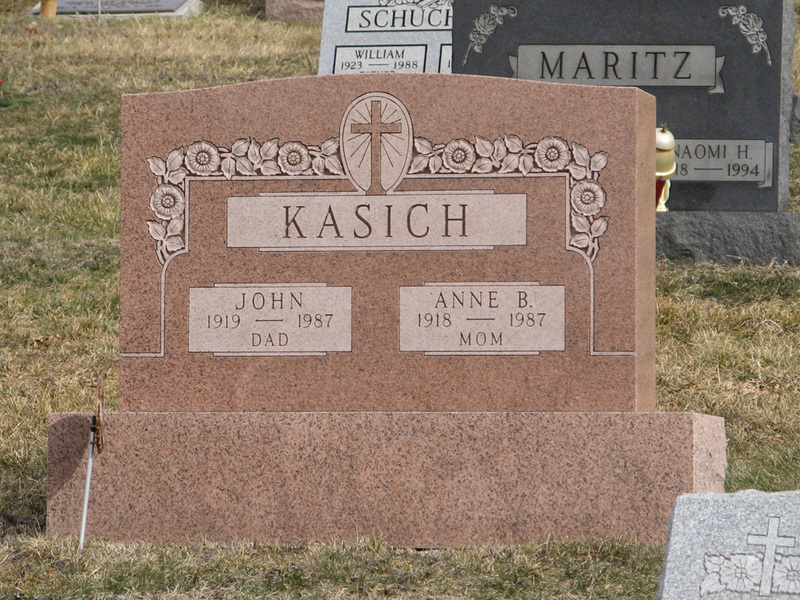 Kasich traced his family tree to the Ukrainian Cultural Family Center. "I was really disappointed when I walked in here that they don't have any sauerkraut pierogies," Kasich quipped." Does anyone know if he has been made aware that he is Rusyn? And if he has been made aware of it, now what is his stance on his ethnicity? I don't know. Laurel Tombazzi, who is head of the Eastern European Congress of Ohio, said she would give the article to his staff, but I don't know if that happened and if it did, if there was any reaction. Excellent research, definitely proves he of Rusyn ancestry on his father's side and already clearly Croatian on his mother's. It's definitely a pity he is unaware of his actual heritage. Not even close to being Czech. It's also a shame he doesn't insist on the proper pronunciation of his name, intead of using an anglicized German version.